Chinese heartthrob Jiang Jinfu's girlfriend has spoken up on the alleged abuse she suffered at the hands of the actor. Japanese model Haruka Nakaura (also known as Zhongpu Youhua), posted several photos online on Monday (Nov 19), which showed dark bruises on her face and arms. Jiang had gone silent on social media for the past month, leading to speculation of trouble in paradise. The actor, who shot to fame after appearing in TV drama Xuan-Yang Sword: Scar of Sky, took a break earlier this year to study in Japan, where he is believed to have met Haruka. 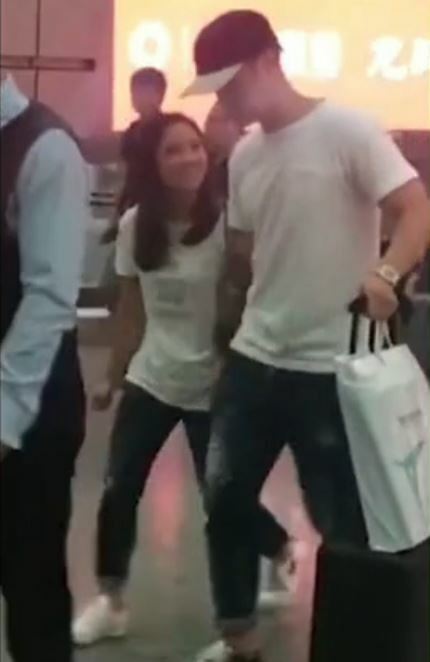 The two of them were last spotted in public at Beijing International Airport in September. In an Instagram post captioned in both Japanese and Chinese, Haruka wrote: "Lately I've caused my loved ones to worry about me. But I, Haruka Nakaura, am still here. "The disappearance of Jiang Jinfu is indeed linked to me. Due to ongoing investigations, my lawyer has advised me not to say more." However, her post has since been deleted. The next day, Jiang, who's currently starring in the TV drama "Royal Highness" broadcast in China, wrote an apology on his Weibo account, admitting to the abuse. "I've lived the past month in regret. I'm sorry to Youhua, my rash actions have caused hurt to you and your family. "No matter what, I should not have hit you, and I'm ashamed of what I did. Without further explanation, I will take responsibility for my actions and accept any punishment. "I sincerely apologise to everyone. Sorry to Dad and Mum, my friends, and I'm sorry to disappoint those who have always cared for me and stood by me." 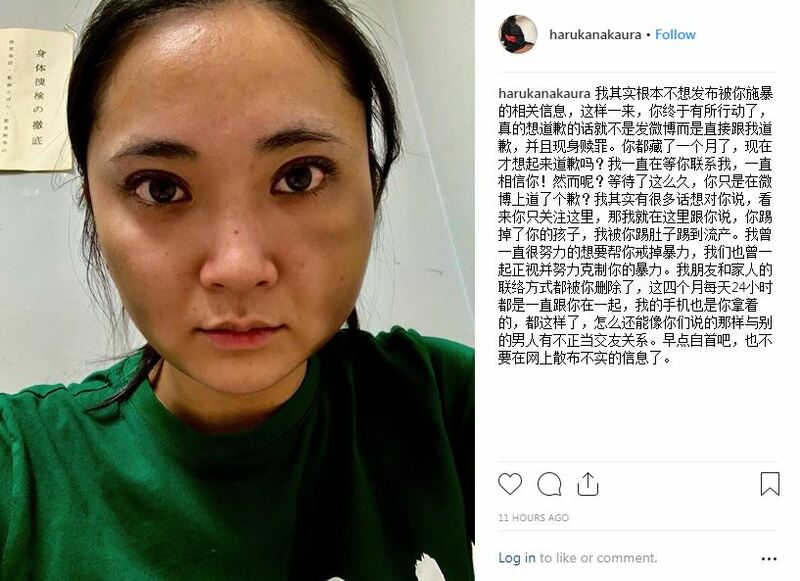 Haruka's last Instagram post on Wednesday (Nov 21) appeared to address Jiang's apology, indicating that he has yet to apologise to her in person. "You'd been in hiding for a month, and you only apologise now? I'd been waiting for you to contact me, but after so long, you only did so on Weibo." "I actually have more to say to you, but since your attention seems to be focused here [on social media], I'll talk to you here." She added that she had tried to help him curb his violent tendencies, without much success. Addressing detractors who claimed that the model was blackmailing the actor and had lied to him about being pregnant, Haruka went on to allege that she had suffered a miscarriage after Jiang kicked her in the stomach. "The contacts of my friends and family have all been deleted by you. These past four months I've been with you for 24 hours a day, my mobile phone has also been held by you. How is it possible that I've been in inappropriate relationships with other men?" wrote Haruka, addressing accusations of her infidelity. Haruka also advised Jiang to turn himself in and stop spreading untruths on the internet. A check on Thursday (Nov 22), showed that her Instagram account had been deactivated. The case has triggered an outpouring of fury on the internet, with netizens and condemning the abuse, and Chinese media outlets debating on the issue of domestic violence. Domestic violence was only recently outlawed in China two years ago in 2016. Victims and those at risk are allowed to receive a personal protection order within up to 72 hours after starting the procedure, reported CGTN. A piece on Beijing Times commented that on Weibo, people have praised Jiang for being the first male celebrity to admit to abusive behaviour and "even gave the thumbs up to Jiang's apology letter", actions which it deemed problematic.